Hungarian sambist Gyorgy Kozsak asserted himself at the Kharlampiev Memorial World Cup that was held in March. The athlete reached the finals in combat SAMBO, in the up to 90 kg weight category, and there he lost to Russian athlete Sultan Aliev. Nonetheless, Kozsak was happy to win the silver medal. In his homeland, the largest daily Hungarian newspaper Blikk reported on his achievement. 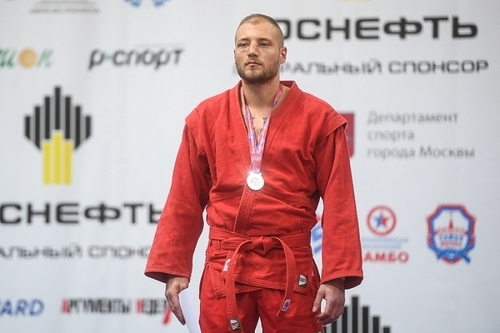 In his interview to the FIAS website, Gyorgy shares what has helped him achieve this result, what he fell in love with SAMBO for, and whom of his opponents he regards as the most threatening ones. — I believe that in the decisive combat I could’ve performed better. Unfortunately, I suffered a minor injury. Yet I think that at the next tournament I will be able to prove myself properly. — Hungarian athletes are not the most frequent participants of the finals at the major international SAMBO tournaments. How did you manage to reach the World Cup finals? — First of all, it was a great deal of work. I had to try hard to achieve such a result. — How long have you been engaged in SAMBO? — I gave it a try for the first time just about six months ago. Earlier, I was engaged in kickboxing and judo. SAMBO as a sport is interesting to me because it has a lot of various technical elements. As to the philosophy of this martial art, SAMBO is an intelligent sport where you need to use your head. You can’t win here only due to your superior physical shape. — What is your goal in SAMBO? — My nearest goal is to win a medal at the European Championships in May. I would love to do this for myself and for my country. And I’m not going to guess what will happen next. Of course, I would be fascinated to participate in the World SAMBO Championships. — Which of your opponents do you regard as the strongest ones in SAMBO? — Without doubt, the Russian athletes take the first place. Who else? It’s hard for me to say, because the Kharlampiev Memorial was just my first major international SAMBO tournament. But it was in Moscow that I felt a huge difference between Russian sambists and representatives of all other countries with whom I had an opportunity to fight on the mat.